India's youngest CEO and Co. President? Meet Shravan Kumaran and his younger brother Sanjay Kumaran – two of the youngest promoters of a company. 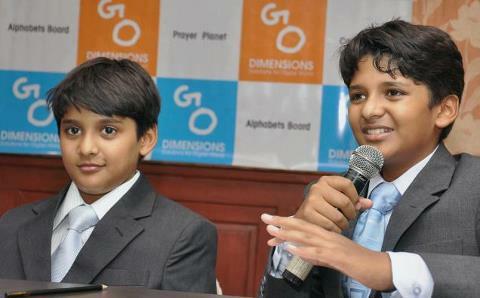 Aged only 12 and 10 respectively, Shravan is the Co-Founder and President of Go Dimensions while his brother is Co-Founder and CEO. When most adults have trouble understanding Java code, these two kids have used the code to build mobile applications. The brothers have together developed four apps for the Apple Store, which have been downloaded more than 10,000 times from 20 countries. Clad in grey suits and ties, these two highly-confident children demonstrated their apps to the media, on the iOS and Android platforms, for games, education and entertainment. Students of Vaels Billabong High International School, both Shravan’s and Sanjay’s interest in computers started early at home when their father got them a desktop computer. Starting with Paint and games on the PC, the two started to make presentations at school and teachers encouraged them to do more. That’s how they turned into mobile app developers. In the CatchMeCop game application, a convict escapes from prison and there is a nationwide hunt for the convict. The convict has to run through a desert, a beach and a maze to outsmart the cops. There are multiple levels of this application, which saw nearly 2,000 downloads in the first month of development. In fact, tech media Web site CNET has reviewed this application too. The other three applications are Alphabet board, a learning app for the iPhone and iPad; Prayer Planet (for religious prayers of various communities) and Colour Palette, a learning app for kids to learn colours.